One promise that we make to our customers is that were are always inspecting and maintaining our fleet to ensure our vehicles are the best of the best. This rolling party transportation solution is certainly a great example of that. 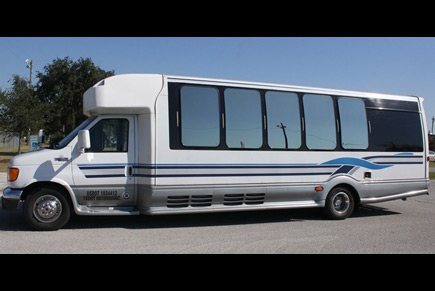 With it's clean white exterior and beautiful mirrored windows our customers love to use this amazing limo bus for events such as their weddings, corporate events, airport service, and even just bar hopping in Houston. There's enough space for all of your friends, bridesmaids and groomsmen and even extra left space over for dancing and having a great time no matter the occasion. Be sure to keep this vehicle in mind when you're ready to have the best time possible in Houston. 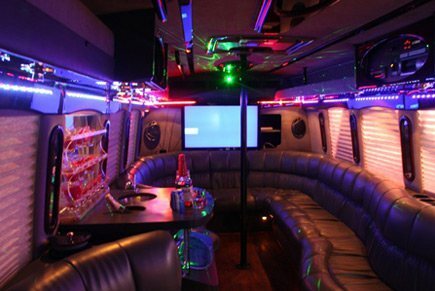 Decked out with all the top tier amenities you want in a stunning limousine bus we have build this one to meet all your celebratory needs, even including champagne chillers to go along with all the other amazing feature like the extremely comfortable, plush leather seating, the big screen high def TV, all the passenger controllable LED lighting, and of course the killer stereo system to connect to your smart phones or iPods to play the perfect mix of songs for your event. Make this bus uniquely yours for the evening or whenever you rent it. Make sure not to wait too long though, this one books up solid well ahead of time so call about it today!